Stay up to date with our latest news and information by joining our mailing list and following us on social media! Submit a Contact Form so we can stay connected with you. Are you looking for a Spirit-led minister for your upcoming meeting? Robert and Tamara are currently accepting invitations to minister The Word and in song. Prayerfully consider Inviting The Nichols to speak and/or sing at your event! Visit our Partnership & Giving page to learn how you can be a part of what God is doing through us here at Word of Faith Ministries. 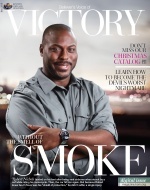 Read this powerful testimony, "Without the Smell of Smoke" featured on the cover of The Believer's Voice of Victory Magazine. The favor of God was Robert's shield when he was faced with a deadly situation!